Во время запуска корабля #СоюзМС10 произошла нештатная ситуация. Сработала система аварийного спасения, корабль совершил посадку в Казахстане по трассе полета. Экипаж корабля жив и вышел на связь! Спасатели уже выдвинулись на поиски и эвакуацию Алексея Овчинина и Ника Хейга. Beim Start des #СоюзМС10 Schiffes gab es eine Kontingenz. Notfall Rettungssystem, das Schiff landete in Kasachstan auf der Flucht Route. Die Besatzung des Schiffes ist lebendig und aus dem Ruder gelaufen! Die Retter sind bereits bei der Suche und Evakuierung von Alexey Ovchinina und Nick Haag vorangekommen. A capsule carrying the two crew members of a Russian Soyuz rocket that malfunctioned on lift-off has landed safely in Kazakhstan. Russian Cosmonaut Alexey Ovchinin and US astronaut Nick Hague are reported to be "in good condition", both Nasa and Russian media said. The crew had to return in "ballistic descent mode", Nasa tweeted, which it explained was "a sharper angle of landing compared to normal". The Soyuz rocket had taken off at 14:40 local time (08:40 GMT) in Kazakhstan for a four-orbit, six-hour journey to the ISS. Soyuz is one of the oldest rocket designs but also one of the safest. 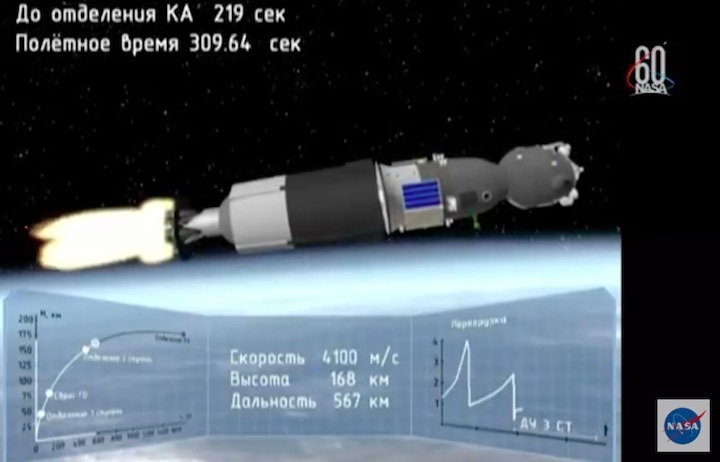 The malfunction appeared to occur around what is termed "staging", where the ascending vehicle goes through the process of discarding its empty fuel segments. The onboard astronauts were certainly aware that something was not right because they reported feeling weightless when they should have felt pushed back in their seats. The escape systems are tested and ready for exactly this sort of eventuality. It would have been an uncomfortable ride back to Earth, however. The crew would have experienced very sharp deceleration on the return. NASA Administrator Jim Bridenstine has shared the following statement on Twitter @JimBridenstine. The Soyuz MS-10 spacecraft launched from the Baikonur Cosmodrome in Kazakhstan to the International Space Station at 4:40 a.m. EDT Thursday, October 11 (2:40 p.m. in Baikonur) carrying American astronaut Nick Hague and Russian cosmonaut Alexey Ovchinin. 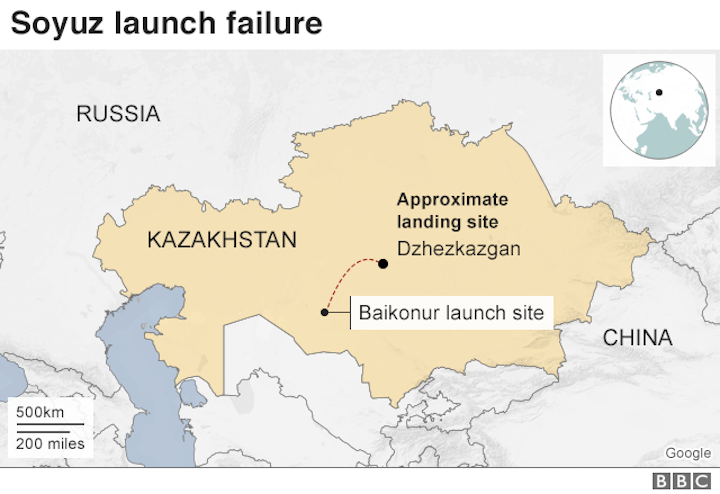 Shortly after launch, there was an anomaly with the booster and the launch ascent was aborted, resulting in a ballistic landing of the spacecraft. Search and rescue teams were deployed to the landing site. 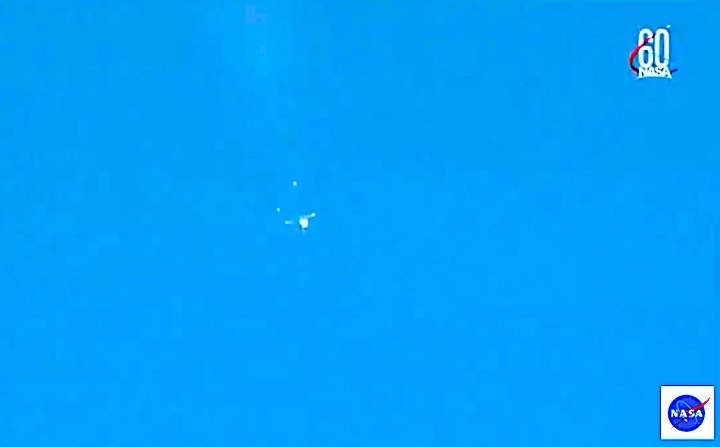 Hague and Ovchinin are out of the capsule and are reported to be in good condition. They will be transported to the Gagarin Cosmonaut Training Center in Star City, Russia outside of Moscow. NASA Administrator Jim Bridenstine and the NASA team are monitoring the situation carefully. NASA is working closely with Roscosmos to ensure the safe return of the crew. Safety of the crew is the utmost priority for NASA. A thorough investigation into the cause of the incident will be conducted. The search and recovery team has reached the landing site, and the crew is out of the capsule and in good condition. Teams have confirmed the crew have landed and Nick Hague and Aleksey Ovchinin are in good condition. Search and rescue teams have been deployed to the landing site and are in contact with the crew. Nach der Notlandung, ISS-Crew 57 wohl auf ! #СоюзМС10: космонавт Роскосмоса Алексей Овчинин и астронавт @NASA Ник Хейг сейчас находятся в Жезказгане и проходят обследование перед вылетом. Генеральный директор Роскосмоса Дмитрий Рогозин (@Rogozin) принял решение о транспортировке космонавтов на Байконур. 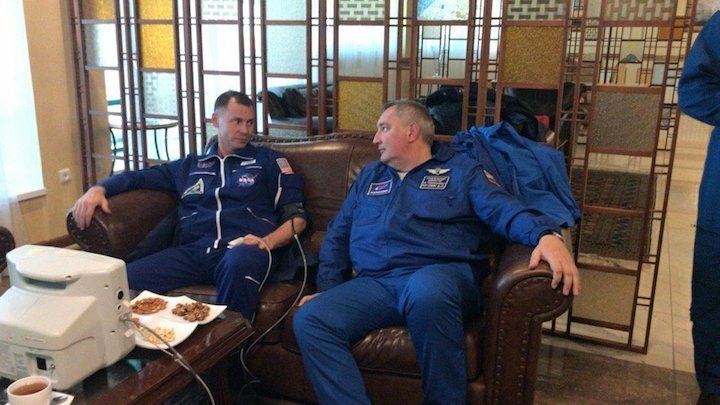 #СоюзМС10: Kosmonaut Roscosmos Alexej ovchinin und Astronaut @NASA Nick Haag sind jetzt in Zhezkazgan und unterziehen sich einer Umfrage vor der Abreise. General Direktor des Roscosmos Dmitry Rogosin (@Rogozin) beschloss, die Kosmonauten nach Baikonur zu transportieren. "The search and recovery teams have reached the Soyuz spacecraft landing site and report that the two crew members... are in good condition and are out of the capsule," US space agency Nasa said. What happened to the rocket? 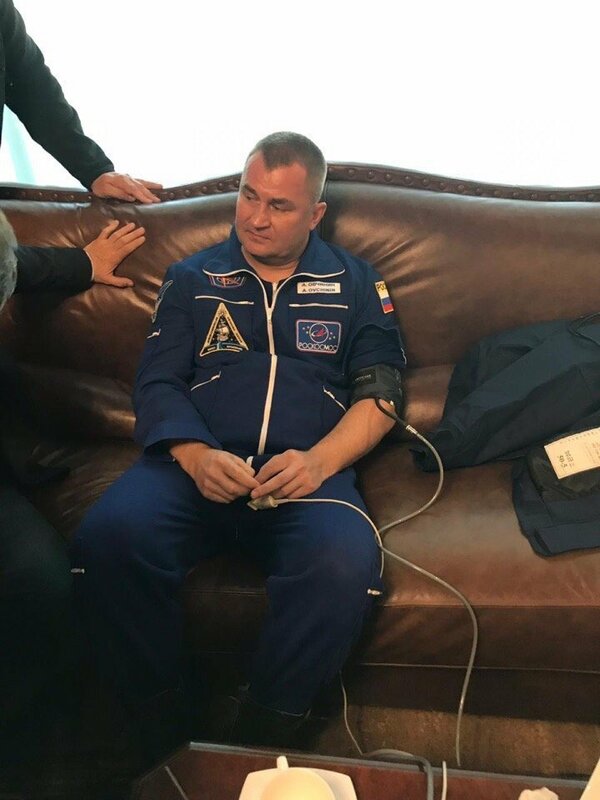 "The emergency rescue system worked, the vessel was able to land in Kazakhstan... the crew are alive," Roscosmos tweeted. Nasa described them as being in good condition. They reportedly did not need medical treatment. 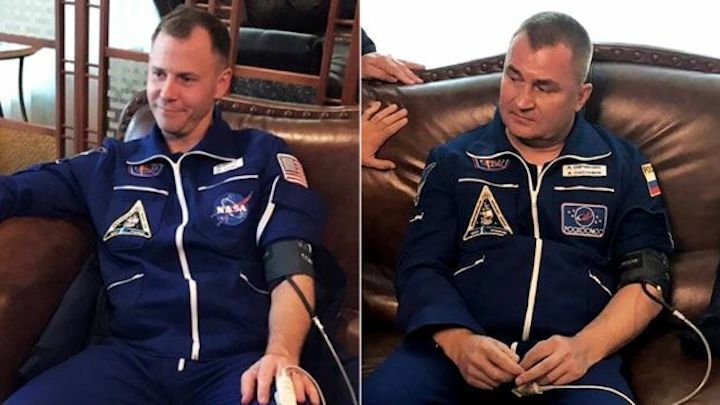 Nasa added that the two men were being taken to the Gagarin Cosmonaut Training Centre outside Moscow, and it was "monitoring the situation carefully". Russia's Deputy Prime Minister Yuri Borisov said no further manned missions would take place "until we believe that the entire situation guarantees safety". He rejected suggestions it could harm US relations, saying they recognised it was a "hi-tech industry linked to risk", but he added: "We certainly won't conceal the reasons, it is uncommon for such situations". The crew already on the ISS will not be affected by Thursday's aborted mission, Russia's Tass news agency reported, quoting an unnamed source as saying they have enough supplies. Thursday's incident is thought to be the first launch mishap for a Russian Soyuz booster since a Soyuz mission was aborted in 1983. A rocket malfunctioned shortly before launch, and the crew vehicle was ejected to safety. In recent years, Russia's space programme has faced a number of technical failures - 13 since 2010. Last year, contact was lost with a Soyuz rocket's Fregat upper stage, which was carrying a new weather satellite and 18 secondary satellites. 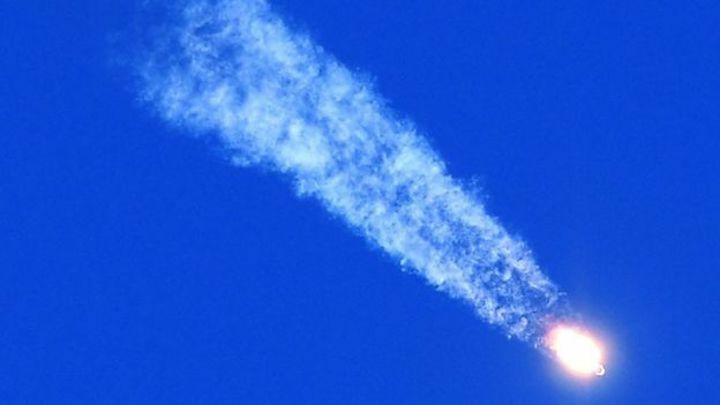 Earlier in 2017, at least nine of a payload of 73 satellites were reported "dead on arrival or severely degraded" after separation from their Soyuz-2.1 launch vehicle. In August, a hole appeared in a Soyuz capsule already docked to the ISS which caused a brief loss of air pressure and had to be patched. In this instance, Russia said the hole may have been drilled "deliberately". One of the most serious but non-fatal US incidents involved Apollo 13 - a mission to the Moon in 1970. An oxygen tank exploded two days after launch causing a loss of power and leading to the mission being aborted. The crew were able to carry out repairs and return to Earth six days later. 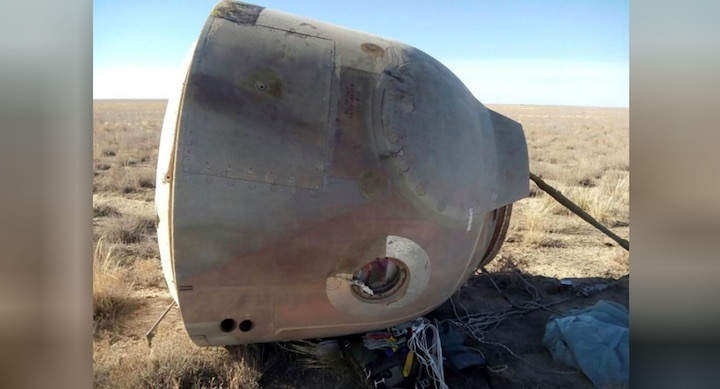 LAS CRUCES, N.M. — An American astronaut and Russian cosmonaut are reported to be in good condition after a problem with their Soyuz rocket minutes after liftoff Oct. 11 forced them to abort their mission to the International Space Station and make an an emergency landing in Kazakhstan. 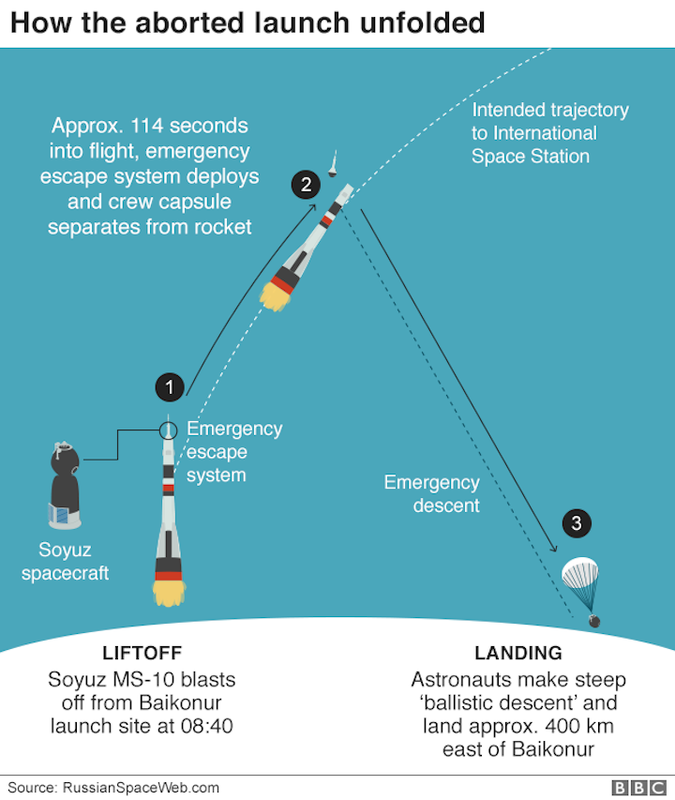 NASA Television reported that the spacecraft was in a ballistic descent after apparently separating from the Soyuz rocket, making a return to Earth rather than heading to the International Space Station. Search and rescue crews arrived at landing site 20 kilometers east of the Kazakh town of Dzhezkazgan. They reported that the two people onboard were in “good condition” and were extracted from the capsule about 90 minutes after liftoff. In a brief presentation at the International Symposium for Personal and Commercial Spaceflight here Oct. 11, Mark Vande Hei, a NASA astronaut who returned from five and a half months on the ISS in late February, said the anomaly took place 119 seconds after liftoff, a second after first stage separation. He added the cause the the anomaly is still unknown. The abort took place several seconds after the launch abort tower on top of rocket was jettisoned, leaving a shroud surrounding the Soyuz that has abort thrusters of its own. “Somewhere around 119 seconds, those thrusters on the shroud took the crew safely away from whatever the problem was,” he said. 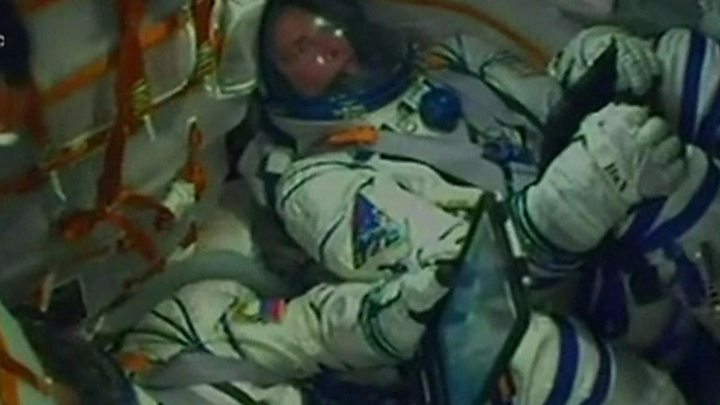 The Soyuz was carrying NASA astronaut Nick Hague, making his first spaceflight, and Roscosmos cosmonaut Alexey Ovchinin, making his second. 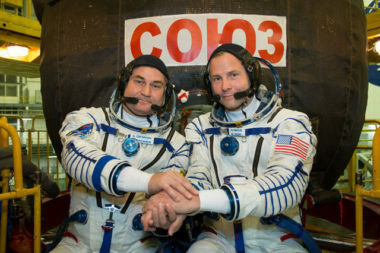 The two were to arrive at the ISS about six hours after liftoff for a half-year stay. Roscosmos announced that a “state commission” has been formed to investigate the anomaly. No media updates are expected on that effort for the rest of the day. A Soyuz failure could jeopardize continued operation of the International Space Station. Soyuz is currently the only means for crews to travel to and from the station, with commercial crew vehicles by Boeing and SpaceX not expected to be ready to enter service before the middle of 2019. The current Soyuz on the ISS, Soyuz MS-09, launched in June and has an orbital lifetime of about 200 days. Expedition 57 Flight Engineer Alexey Ovchinin of Roscosmos, left, and Flight Engineer Nick Hague of NASA, right. 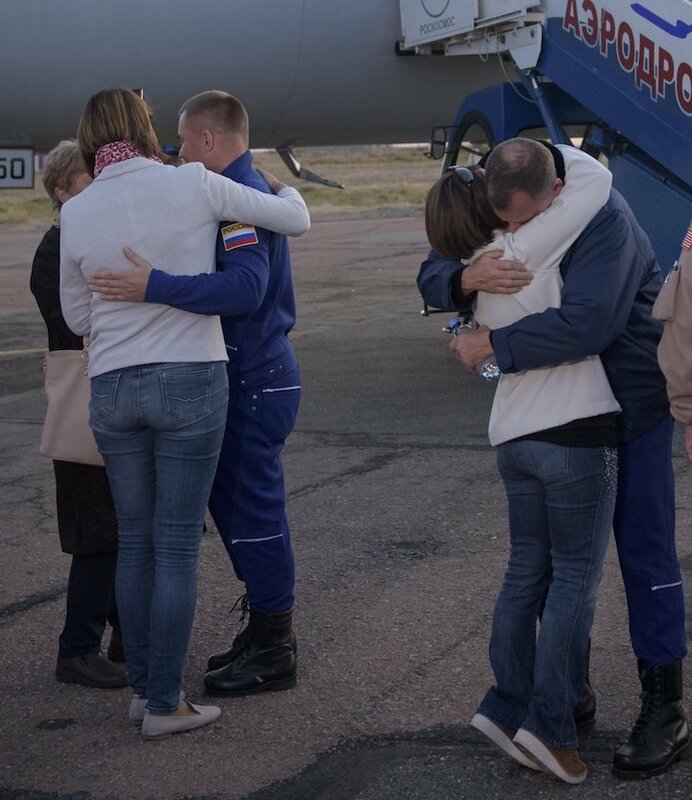 embrace their families after landing at the Krayniy Airport, Thursday, Oct. 11, 2018. 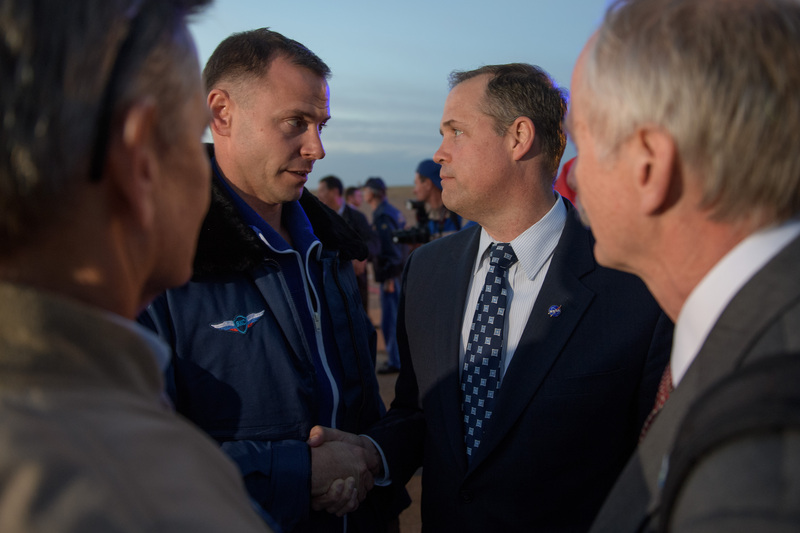 Expedition 57 Flight Engineer Nick Hague of NASA, left, is welcomed by NASA Administrator Jim Bridenstine after Hague landed at the Krayniy Airport. Search and rescue teams deployed to the landing site, arriving on location before the spacecraft landed. Hague and Ovchinin were recovered from the capsule and were in good condition. The crew landed south of the city of Zhezkazgan, Kazakhstan, and was transported by helicopter to the nearby city. 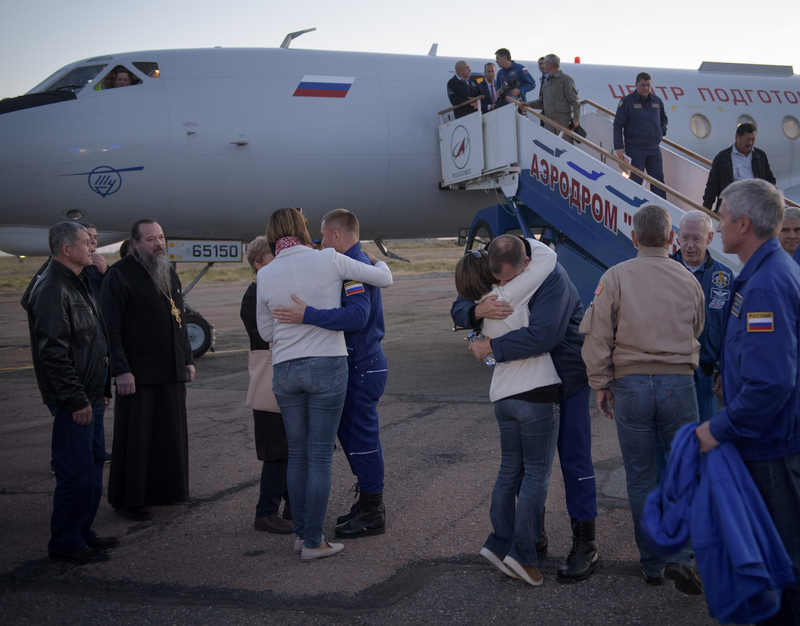 A Roscosmos plane then flew the pair to Baikonur, where they were greeted on the tarmac by their families, NASA Administrator Jim Bridenstine, Roscosmos Director General Dmitry Rogozin, and other NASA and Roscosmos officials. Hague and Ovchinin were taken to a local hospital for precautionary medical checks. They are scheduled to return to the Gagarin Cosmonaut Training Center in Star City, Russia, outside of Moscow, on Friday, Oct. 12. Hague is expected to fly home to Houston next week. Roscosmos has formed a commission to assess the root cause of the failure, and NASA will support Roscosmos’ investigation into the incident. In parallel, NASA and the International Space Station partners will review upcoming operational schedules, including the plan for two spacewalks targeted later in October. 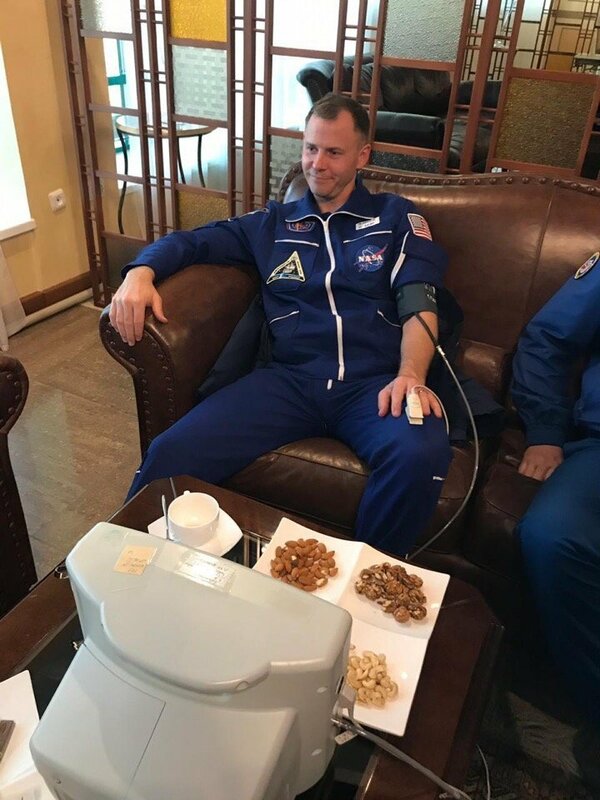 In an interview, Bridenstine shared his experience witnessing the launch in Kazakhstan, as well as his admiration for the NASA and Roscosmos teams who demonstrated how well prepared and expert they were in responding to the situation. He also gave high praise to Hague’s wife, Catie, for remaining cool under pressure. Roscosmos Director General Dmitry Rogozin said in an interview that he was pleased with his team’s response, and that a Russian commission would work to understand the cause of the failure and continue working with NASA and the rest of the international station partner agencies to support continued station operations. Kenny Todd, International Space Station operations integration manager, shared his thanks with the Russian search and rescue teams in a news conference on NASA Television, praising their professionalism and expertise in doing their jobs quickly and efficiently to ensure the safety of the crew. He noted the station is well-supplied for the Expedition 57 crew members who are on board. 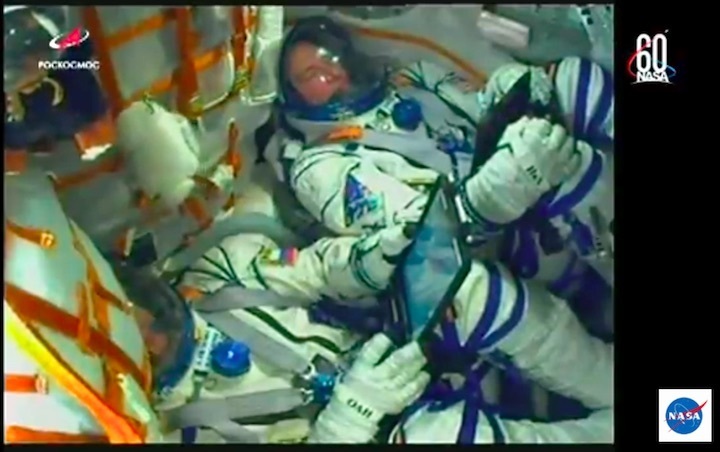 Deputy Chief Astronaut Reid Wiseman noted that the safe return of the crew members is good news, demonstrating that the safety systems worked as designed, and the teams performed as they have practiced, to ensure the safety of Hague and Ovchinin.